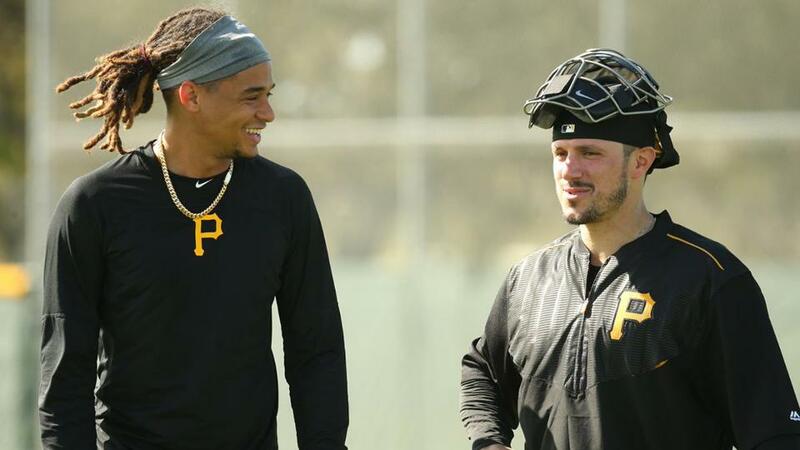 BRADENTON, Fla. — Francisco Liriano was back in the Pirate City clubhouse on Monday morning, setting up the same locker he occupied three springs ago. Things are different now. In 2014, he received the largest free-agent contract in Pirates history. This spring, he’s competing to make the Opening Day roster after signing a Minor League deal. Liriano had a few offers on the table, he said, but nostalgia may have played a part in his decision. Some of his best seasons began in this clubhouse. One of the highlights of his career took place in Pittsburgh. On Oct. 1, 2013, Liriano started the Pirates’ 6-2 win over the Reds in the National League Wild Card Game before a sea of black-clad fans at PNC Park. The Pirates are reporting for Spring Training with that goal in mind. There will be 62 players in big league camp when the full squad works out on Feb. 18 and games begin on Feb. 23. Only six of them — Liriano, Francisco Cervelli, Starling Marte, Gregory Polanco, Elias Diaz and Jung Ho Kang — played for the Bucs when they won 98 games but lost the NL Wild Card Game to the Cubs in 2015. Only Liriano and Marte were on the 2013 team that brought postseason baseball back to Pittsburgh for the first time in 21 years. The 2019 Pirates won’t be burdened with the pressure of ending a 20-year losing streak. They outperformed preseason projections last year by finishing 82-79, the club’s first winning season since ’15. The external expectations won’t be much higher this spring. The Pirates finished fourth in their division last year, and the NL Central got better. The Brewers continued to add. The Cardinals made a splash with their trade for Paul Goldschmidt. The Reds aren’t rebuilding anymore. The Cubs still have their championship-winning core in place. Meanwhile, the Pirates had a quiet offseason. As the club cut payroll, general manager Neal Huntington worked to sign a handful of players with upside — Kang, Liriano, Lonnie Chisenhall and Jordan Lyles among them — to low-risk deals. But they believe they can contend. Specifically, the Pirates are counting on the pitching staff they bolstered before last year’s non-waiver Trade Deadline by adding Archer and setup man Keone Kela. The Pirates put together a 3.52 ERA after the All-Star break last season, the fourth-best mark in the Majors. Their rotation is built around Archer, Jameson Taillon, Trevor Williams and Joe Musgrove, with Lyles likely to claim the final spot. They think they have a lock-down bullpen with All-Star closer Felipe Vazquez joined by setup men Kela, Kyle Crick and Richard Rodriguez. The Pirates are hoping for more out of the same group of position players. They like their outfield and their catchers, but they need a better season from their largely unproven infield. Their most significant change might have been on the coaching staff, as they brought in new hitting coaches Rick Eckstein and Jacob Cruz.